Thani Oruvan pits a dedicated police officer against a corrupt scientist in psychological thriller that has plenty of drama and action. The writing collaboration between director Mohan Raja and Subha results in a cleverly plotted story with some unexpected twists, but the real success lies in the detailed development of the two main characters. Neither is completely black or white, although the shades of grey are relatively muted, while the cat and mouse relationship between the two provides good structure to the film. Excellent performances from the whole team but particularly Arvind Swamy as the villain of the piece ensure that Thani Oruvan is a better than average police drama and one that’s well worth a watch. You know a film is going to be pretty epic when the story starts with a dramatic birth. Sengalvarayan (Thambi Ramaiah) is a party man through and through to the point where it’s more important to him that he ties flags for his leader’s appearance rather than take his heavily pregnant wife to hospital. The leader senses an opportunity for some good publicity and sure enough, the baby is born in the back seat of the politician’s car leading Sengalvarayan and his new son Pazhani to develop a relationship with the man who will later become Chief Minister (Nassar). The significance of these events doesn’t become apparent until later on but they provide an instantly intriguing start to the film. After the dramatic opening, the story moves to a group of young police officers in training and their vigilante-style activities against the local criminal community. Despite the group’s best efforts, the crooks never stay in jail and Shakthi (Ganesh Venkatraman), Suraj (Harish Uthaman), Kathiresan (Sricharan) and Jana (Rahul Madhav) all look to their friend and natural leader Mithran (Jayam Ravi) for a solution. Naturally Mithran has a plan, having spent the last few years investigating all known criminal activity and discovering that all crimes are interlinked and ultimately committed by a small group of individuals. As a result he’s made it his mission in life to eliminate one of these top 15 criminals responsible for all of the crime in India, and of course his buddies want in on the action. He has a shortlist of three possible men to choose from; Ashok Pandian (Nagineedu), Perumal Swamy (Madhusudhan Rao) and Charles Chelladurai (Saiiju Kurup) who between them (according to Mithran) account for 80% of the criminal activity in the country. Mithran’s biggest problem is which one to choose, although I’m not entirely sure why he couldn’t decide to eliminate all three given that he has his whole career ahead of him and could work on knocking off one every 10 years or so. Regardless, while he is working out which one to target, he discovers that all three actually work for a much bigger villain – highly respected scientist and Padma Shri awarded Siddharth Abimanyu (Arvind Swamy). Siddharth is known for his work in the pharmaceutical field but in reality he’s the mastermind behind all sorts of criminal activity and not a nice man at all, despite his designer suits, fashion model wife and impressive collection of University degrees. Siddharth is of course the grown up young boy from the start of the film and his inept father is now the Health Minister in Nassar’s government, allowing Siddharth to do basically whatever he wishes. Mithran and Siddharth cross paths when an American drug company owner comes to India to open access to lifesaving medications – something that Siddharth and his associates will go to any lengths to prevent. Once Siddharth becomes aware of Mithran and his attempts to put him out of business, the contest between the two begins in earnest with each determined to eliminate the other no matter what it takes. The characterisations are the key here and while Mithran doesn’t have all the answers he uses a methodical approach and informed reasoning to work out what Siddharth will do next. Almost too good to be true, Mithran is depicted as a dedicated and passionate police officer with a strong sense of social justice, who is almost hyper-aware of crime in his surroundings. However as he gets drawn into a battle of wits with Siddharth his obsession threatens to take over his life while his friends and allies become tools to use in his fight. His motto is that a man’s capability is defined by the quality of his enemies and by that measure he needs to be very capable indeed. Mithran’s passion for justice is what makes him get out of bed in the morning, so he has none left over for potential love interest Mahima (Nayantara) and as time goes on, little patience to deal with his friend and colleagues either. These shades of grey give Mithran more credibility and offset his tendency to indulge in pompous and long-winded speeches about truth, justice and the rights of all to obtain cheap pharmaceuticals when required. Jayam Ravi is perfectly capable as Mithran but he is very serious and it would have been good to see an occasional smile outside of the obligatory song with Mahima. Siddharth is a more cerebral villain than usual and uses his political influence to neutralise any threat from Mithran while his quick reactions and scientific knowledge also stand him in good stead to outwit the police officer at almost every turn. He doesn’t throw tantrums, swear vengeance or send out gangs of thugs as Tamil criminal masterminds are wont to do, instead he simply adapts, moves on and changes direction. Arvind Swamy is excellent as the criminal mastermind, with the beauty of his characterisation lying in just how very ordinary his Siddharth is. He’s rich – designer suits, trophy wife and beautiful house all attest to how wealthy he is, but on the surface he could be any scientist working on medical breakthroughs with no indication of how cruelly callous he can be when required. Those moments when he casually orders someone’s death or explodes into controlled violence are almost totally unexpected and seem to come out of nowhere, making Siddharth a very effective and chilling villain despite his generally debonair persona. Nayantara’s character Mahima is interesting too. On one hand she’s the typically dumb love interest who thinks that by following the hero around and declaring her love at every eventual opportunity she will eventually wear him down – and to be fair that is what happens here too. But on the other hand, she’s a forensic scientist who has some good ideas to help Mithran’s investigation, and appears coolly capable and professional in her work. If only Mohan Raja had avoided the ‘love at first sight’ cliché and given Mahima and Mithran a more plausible and realistic romance I would have liked her character more. But Nayantara does give Mahima professional competency and a no-nonsense approach most of the time that fits well with the overall tone of the film. The rest of the cast are good with Thambi Ramaiah providing some laughs as an inept politician, but mainly giving a further insight into the character of Siddharth. Rahul Madhav is the best of Mithran’s friends, Vamsi Krishna is suitably menacing as Siddharth’s hitman, while Mugdha Godse is good in her brief but important role as Siddharth’s wife. The film looks good too, with effective use of split scenes and an effective mix of technology and good old-fashioned fight scenes. There are a few leaps of faith required but they aren’t too ridiculous and mostly the plot makes sense. Thani Oruvan is an intelligent thriller with a good mix of action and drama and excellent characterisations. It is a little overlong, but the story keeps moving along at a good pace and like any good page-turner it’s always worth finding out what happens next. Worth watching for Arvind Swamy’s villainous scientist and the psychological cat and mouse game between Siddharth and Mithran. 4 stars. I haven’t been too impressed with the last few Puri Jagannadh films I’ve seen, but I was hopeful that this latest offering starring my favourite hero might offer something a little different. 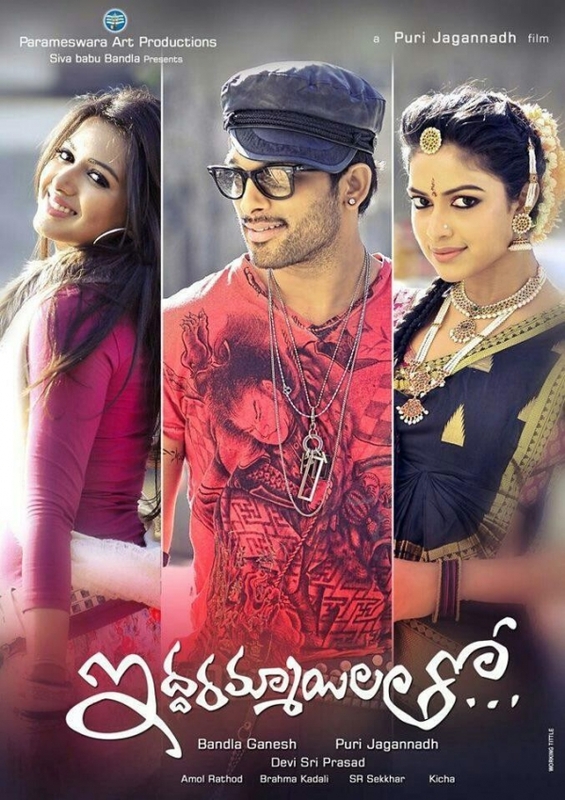 But although the film is visually very pretty and both Bunny and Amala Paul do their best with their respective characters, the story has far too many plot holes and is frequently too unbelievable to make Iddarammayilathi anything other than disappointing. While there is the expected excellent dancing from the stylish star, some good fight scenes and Bunny and Amala make a sweet couple, it’s just not enough to make up for the screechy, irritating Catherine Tresa and a dire comedy track which almost completely derails the film in the second half. The film follows Akanksha (Catherine Tresa), the daughter of a prominent politician in India (Rao Ramesh) who moves to Barcelona to study psychology. She has a fantastic room which just happens to contain a box belonging to the last tenant. Inside is a diary which tells the story of a romance between Sanju (Allu Arjun) and the room’s previous occupant, Komali (Amala Paul). The romance is played out in flash-back as Akanksha talks endlessly to herself about the diary’s revelations and frankly seems far too interested in the details of a stranger’s love life. Bunny looks great as Sanju Reddy, a singer/dancer who performs with his band in the streets of Barcelona and is surprisingly successful considering that the band seems to perform exclusively in Telugu in a Spanish/Catalan speaking city. He’s also pretty nifty when it comes to the obligatory biffo although his prowess in this area is never really explained – but then neither is anything else so at least there is consistency in the lack of elucidation. Sanju falls in love with Komali who is in Barcelona to learn classical music from Brahmi – again, completely nonsensical but there is even more absurdity to follow. Amala does a good job as a demure and rather shy violinist apart from being completely unable to fake playing a violin. She does look stunning though in some beautiful costumes and has good chemistry with Bunny so at least the romance part of the story is believable. The love story ends abruptly in the diary so Akanksha tracks down Sanju to find out what happened and learns of a tragedy that occurred when Sanju and Komali crossed paths with a gangster (Shawar Ali). Shawar Ali has to be the dullest and most incompetent villain ever and it’s surely only by chance that Komali is the only person who sees him execute one of his gang on an incredibly public beach in broad daylight. Unbelievably, it takes all the might of his gang of assorted thugs, sword-wielding ninjas and Subbaraju in a rather dapper beanie to deal with one petite classical violinist and her guitar playing boyfriend! While Akanksha shrilly indulges in flagrant scenery chewing and desperately tries to persuade Sanju to fall in love with her, Sanju has his own agenda for revenge which ends up with a surprisingly good and effective plot twist with a flashback to some of those awesome sword fighting techniques from Badrinath. Overall, apart from the woeful comedy scenes with Brahmi and Ali, the second half moves faster and is a little better than the first, although that may just be that I stopped worrying about the lack of logic and settled back to enjoy Bunny’s dancing and the fact that he does look as if he can actually play a guitar. The fight scenes by Kecha are also beautifully choreographed and appear more like dancing than fighting, an effect which is heightened by Sanju’s total lack of emotion as he calmly and efficiently despatches everything and everyone that is thrown at him. Iddarammayilatho looks beautiful and cinematographer Amol Rathod makes the most of the location in Barcelona, showcasing some of the beautiful buildings in the city, but the film is let down by a complete lack of logic in the story and very little in the way of character development . Although the cast in general put in good performances, most of the supporting mothers, fathers etc have very little to do and both Subbaraju and Srinivas Reddy are chronically underused. Brahmi is fine in the first half but the comedy with Ali is totally pointless and almost as irritating as Catherine Tresa. Perhaps understanding the dialogue might have made Akanksha a more appealing character, but somehow I doubt it. I still enjoyed the film, but more for the location, action scenes and dance numbers which were all good. Overall, Iddarammayilatho is worth a look for Allu Arjun fans and anyone who likes movies with pretty scenery and great architecture.